Every time I participate in a #G2Great twitter chat, I’m in awe. What is it about this chat that motivates people in every time zone to juggle dinner arrangements, carpools, bedtime stories and dozens of other daily realities to be part of the conversation on Thursday nights? For me, it’s the fact that the topics are so relevant. The questions are so thought-provoking. The perspectives are so diverse. And the dialogue is simultaneously passionate yet respectful . Every time I participate, I grow. 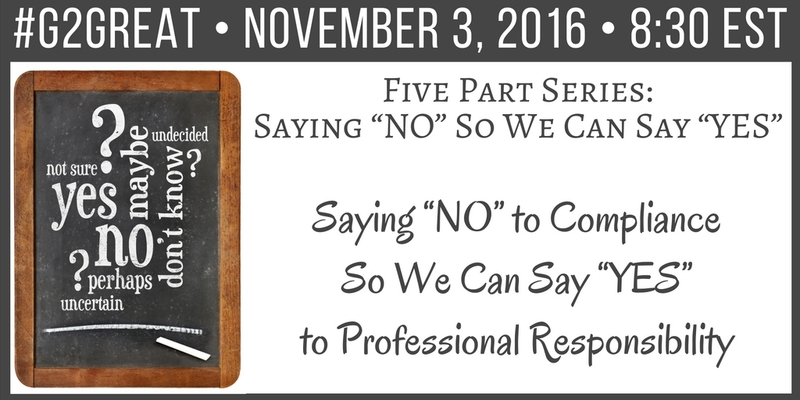 This Thursday’s topic, Saying “No” to Compliance So We Can Say “Yes” to Professional Responsibility was no exception. Thursday night’s chat helped refresh and revitalize my thinking about this crucial topic. Using the collective brilliance of Thursday’s #G2Great chat participants, today’s post contains five considerations for helping us cross that bridge between “us” and “them” while staying focused on our one common and constant mandate: Do right by kids! 1. We’re all on the same team. Although we have diverse roles within the system, we are all here for one purpose. We’re here to serve children. The children are wise and wonderful. When we keep our eyes and our hearts on them, we are more likely to move in the right direction. The face of a child can become a source of energy and courage when there’s tough work to do or there are tricky decisions to make. During the chat, Gravity Goldberg reminded us that the best questions are WHY questions. Whether a decision is coming from inside or outside of the classroom, as reflective educators and decision-makers we must keep working to name our “Why?” Whenever a practice comes into question it provides the perfect opportunity to revisit the questions of ‘Why?” If Simon Sinek had been able to join us on Thursday night, he might have reminded us that great leaders always start with why. 3. Professional decisions are research-informed. It never feels good to be asked to do things we don’t understand or believe in. But once we understand the “why” we’re better positioned for critical dialogue about “how” and “what”. As the great Marie Clay reminds us, there are different paths to common outcomes. These alternate paths, of course, should not just reflect our personal preferences, or “the way we’ve always done it”. Instead, we must follow the signposts of research, learning theory, and of course the children in front of us. If we’re doing our jobs as educators, we’re stretching and growing right alongside our students. We’re constantly asking ourselves, “How can we make our school even more responsive to the needs of our students?” And we’re looking for answers through collaborative decision-making, reflective dialogue, and professional learning, not a push for blind cookie-cutter compliance to a program. Programs will never solve our problems. Only better teaching can. 5. Keep the door open. Yes! We must learn to ask brave questions when things don’t feel right. We must share our ideas freely. We must stand up for what we believe our students need. But we must also challenge ourselves to listen wholeheartedly and completely. We must learn to look for common ground and the thread of good that is usually hidden on the other side of the divide. We must dare to open our doors, rather than close them. Honest, respectful dialogue is our best tool for bridging whatever gap we find ourselves needing to cross. The journey from compliance to professional responsibility can only happen one brave act of trust, one honest conversation, one research-informed alternative, and one student-centered decision at a time. And when it comes right down to it, maybe our common mandate and our professional responsibility are one in the same: Do right by kids. I’d love to connect and continue the conversation. Follow my blog SimplyInspiredTeaching.com where I share ideas, inspiration, and companionship for the journey. 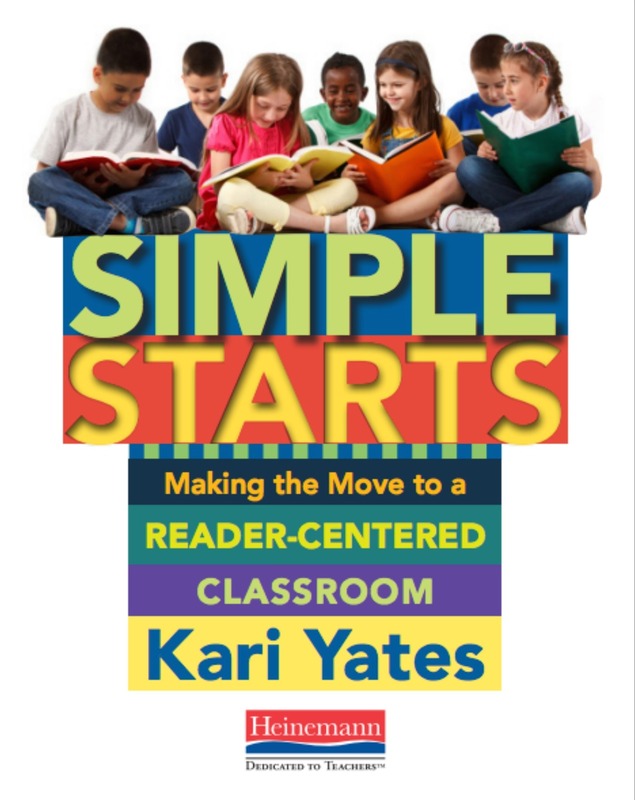 Check out my book, Simple Starts: Making the Move to a Reader-Centered Classroom from Heinemann.